RWA invites newsletter sign-ups in person, via email, via websites, or via the Insight blog. Those submitting their personal details (name, job title, phone number, email address) will be added to a CRM database (provided by Capsule) and sent weekly emails (via MailChimp or Campaign Monitor) regarding regulatory and relevant professional topics. Open rates and interactions with emails are recorded for analytical purposes. 2. To manage and service email newsletter lists. RWA will monitor email engagement and maintain a permission-based database. Data will be retained for a minimum of seven years. 3. To service client accounts and fulfil client contracts, including maintaining a record of correspondence. In line with professional practices, details of correspondence will be recorded for a minimum of seven years. 4. To manage the dialogue between RWA and prospect accounts. RWA will seek to continually refresh consent with prospects wherever possible. 5. To manage e-Learning platforms and individual accounts, to record platform usage, and continually develop the functionality our e-Learning solutions. Data will be retained for a minimum of seven years. RWA practices a policy of data minimisation. We will only record essential data and will minimise and securely dispose of any data, which is no longer required. 6(1)(f) - Processing is necessary for the purposes of the legitimate interests pursued by the controller or by a third party, except where such interests are overridden by the interests or fundamental rights and freedoms of the data subject which require protection of personal data, in particular where the data subject is a child. 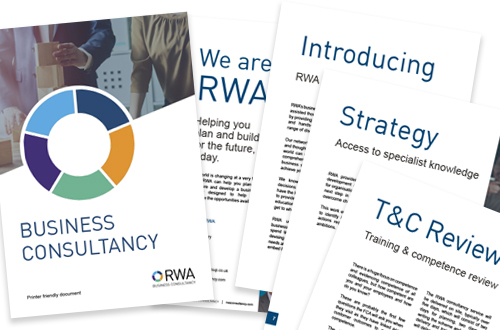 Where RWA does use third parties outside of the EU to process data relating to EU citizens, it will ensure that suitable contracts, policies, procedures and recognised data protection standards or codes of conduct are in place to protect personal data.